ආණමඩුව නගරයේ තිබූ ආපන ශලාවකට (11) අද අලුයම කිසියම් පිරිසක් ගිනි තබා විනාශ කිරිමට කම්පා වූ නගරයේ ව්‍යාපරික සංගමය හා ජනතාව එක්ව දිනක් ගතවීමටත් මත්තෙන් අදාල ස්ථානය තිබූ තත්වයට ගෙන ඒමට කටයුතු කර තිබුණි. ආණමඩුව නගරයේ ව්‍යාපාරිකයින් හා ජනතාව අතර ඉතා හොඳ ලෙන්ගතු කමින් සිටි ව්‍යාපාරිකයකුගේ කඩයකට මෙලෙස ගිනි තබා තිබිණි. එම ව්‍යාපාරිකයාට සාධාරණයක් ඉටු කරමින් ආණමඩුව නගරයට කළු පැල්ලමක් එක් කිරීමට උත්සහ කළ කඩාකප්පල් කාරින්ට පාඩමක් කියා දෙමින් ගිනි ගෙන විනාශ වූ ආපන ශාලාව යලි සකස් කර දීමට කටයුතු කටයුතු කර තිබුණි. මෙම ගිනි ගැනීමෙන් අසල තිබූ දුරකථන වෙළෙඳ සැලකටත් බුලත් විට අලෙවි කරුවකුගේ කුඩා පෙට්ටි කීපයකටත් හානි වී තිබුණු අතර ඒවාද යලි පිළිසකර කිරීමට ව්‍යාපාරික සංගමය කටයුතු කළේය. මේ කටයුතු සඳහා සිංහල , දෙමළ , මුස්ලිම් සියලු දෙනාම එක්ව තම දායකත්වය දක්වන ආකාරය දැක ගත හැකි විය. ආණමඩුව නගරයේ පිහිටි ආපන ශාලාවකට පෙට්‍රල් බෝම්බ ප්‍රහාරයක් එල්ල කිරීමේ කිරීමේ සිද්ධියට සම්බන්ධ සැකකරුවන් 7 දෙනෙකු ආණමඩුව පොලීසිය විසින් අත්අඩංගුවට ගන්නා ලදි. ඊයේ (11) අලුයම 2.00 ට පමණ එල්ල කර ඇති පෙට්‍රල් බෝම්බ ප්‍රහාරයෙන් ආපන ශාලාව ගිනි ගෙන විනාශයට පත් වී තිබුණි. ගිනි තබා විනාශ කරන ලද ආපන ශාලාවට ආසන්නයෙන් ඇති වෙළඳසලක සවි කර තිබූ ආරක්ෂිත කැමරා පද්ධතියක දර්ශන උපයෝගී කරගෙන විමර්ශන සිදු කිරීමෙන් පසු සැකරුවන් අත්අඩංගුවට ගැනීමට පොලීසියට හැකි විය. අත්අඩංගුවට ගෙන ඇති සැකකරුවන් වයස අවුරුදු 19 - 25 වයස් හි පසුවන්නන් වන අතර ඔවුනට එරෙහිව හදිසි නීතිය ක්‍රියාත්මක කිරීමේ පනත අනුව අධිකරණමය ක්‍රියා මාර්ග ගන්නා බව පොලීසිය පවසයි. 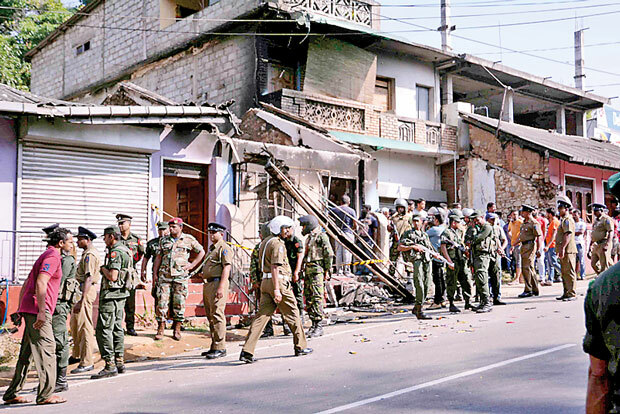 The religious and communal violence that erupted in Kandy could end up stymying the momentum built up in the tourism industry over the past three months, as signs are emerging that foreign tourists are cancelling their visits to Sri Lanka. 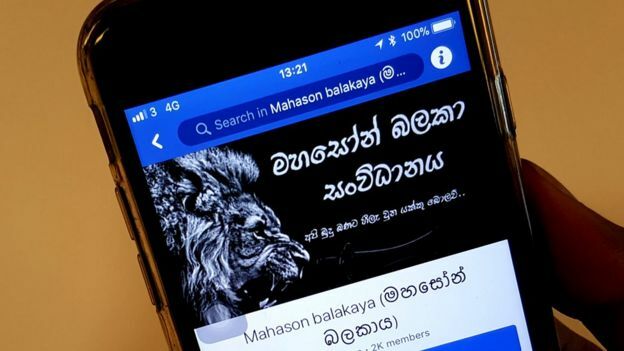 Over 80 tourists have cancelled their bookings made at one of the top three travel companies in Sri Lanka, which could possibly amount to a loss of 800 nights, Mirror Business learns. This is despite the Sri Lanka Tourism Development Authority (SLTDA) constantly issuing updates on the situation, and working with tourism stakeholders and the police to ensure the safety of tourists in the Central district. Attempts to reach the top management of most of the leading travel companies and the two apex industry bodies—Sri Lanka Association of Inbound Tour Operators (SLAITO) and The Hotels Association of Sri Lanka (THASL) were unsuccessful, as most were in attendance at ITB Berlin, the largest travel trade show in the world. Back home, SLTDA Chairman Kavan Ratnayake hit back strongly against individuals and groups inciting religious and ethnic tension. “This is a wakeup call that shows the significance and the gravity of immature action on the part of those who contributed to this situation. The next time before someone throws a stone, or engages in any kind of road-rage, they should think ten times of the wide-ranging economic consequences of their actions,” he said. Ratnayake said that the tourism industry is projected to be the leading foreign exchange earner for Sri Lanka in two years, and the society should understand the importance of preserving a peaceful environment to sustain the growth of the industry. “The loss of income affects not only the major hotels, but also the street seller, the tuk-tuk driver, the farmer and the restaurant worker,” he added. The tourism industry was just getting back into gear after 2017 turned out to be a disappointment with a partial airport closure and a dengue epidemic, which resulted in nearly flat growth. Relatively moderate growth last December was followed up by double-digit growth in January and February this year from key markets due to the winter season and the Chinese New Year, before the current tension in the major tourism hub of Kandy spurted. Sparks flew with a roadside brawl over a truck driver thwarting a three-wheeler from overtaking, which resulted in the latter assaulting the truck driver who passed away from the wounds sustained. The incident escalated into communal violence, with residents of the area fanning flames of religious hatred over the fact that the truck driver was Buddhist and the assailants were Muslim. Another death of a Muslim resulted in the ensuing chaos. Foreign media provided wide coverage on the developments, and the US, British, UAE and Australian governments issued travel advisories for their residents visiting Sri Lanka. However, the national carrier SriLankan Airlines, which flies most of the tourists to Sri Lanka, issued a statement, which said that it has yet to see a massive cancellation trend. “There could be some cancellations. 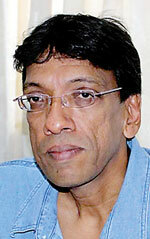 We are closely monitoring the situation, but so far we are unaffected,” SriLankan said. A source within the airline yesterday said that it would take a day or two before the airline could state whether cancellations have substantially increased due to the situation. මහනුවර ප්‍රදේශ කිහිපයක ඇතිවූ කලහකාරී තත්ත්වයට සෘජුවම බලපෑම් කළ බව කියන ‘මහසෝන් බලකාය‘ යන නමින් යුත් සංවිධානය හා ආශ්‍රිත සිංහලේ ෆේස් බුක් පිටු පවත්වාගෙන ගිය ප්‍රබල සාමාජිකයෙකු වන ඔහුවද අනෙක් 10 දෙනා සමග වැඩිදුර ප්‍රශ්න කිරීම සදහා අද කොළඹට ගෙන එන ලද බව වාර්තා විය. ජාතීන් අතර ගැටුම් නිර්මාණය කිරීම අරමුණු කර ගනිමින් විවිධ ප්‍රචාර සිදුකරන, නොමඟ යැවීම සිදුකරන ඕනෑම පුද්ගලයෙක් අත්අඩංගුවට ගැනීමට මේ වන විට රට පුරා මෙහෙයුම් ක්‍රියාත්මක බවද පොලිසිය දන්වා ඇත. මහනුවර අන්තරායකාරී පරිසරයක් නිර්මාණය කරන්නට ජාතික අසමගිය ඇති වන ප්‍ර‍චාරයන් සමාජ මාධ්‍ය ඔස්සේ සිදු කරමින් සිටි පුද්ගයින් 10 දෙනෙකු ත්‍රස්ත විමර්ශන අංශය මගින් අත්අඩංගුවට ගෙන ඇති බව පොලිස් මාධ්‍ය ප්‍රකාශකවරයා අද සවස දැනුම් දුන්නේය. එහි ප්‍රධාන සැකකරු විදානපතිරණගේ අමිත් ජීවන් වීරසිංහ සහ දෙවැනියා ලෙස හදුනාගත් නස්නාරං පට්ටියගේ සුරේද සුරවීර ද සිටින බව ඔහු සදහන් කළේය. ‘මහසෝන් බලකාය‘ නමැති කල්ලියක් ඔහු නිර්මාණය කර තිබුණ බවද පැවසුණ අතර නිරන්තරයෙන්ම සිය මුහුණින්ම ෆේස් බුක් වෙත සජීවීව එමින් අන්‍ය ජාතීන් හෙළා දකින අදහස් පැතිරීමට කතා පැවැත්වූ අයෙකි. අමිත් ජීවන්ගේ සහායක ලෙස කටයුතු කරන නස්නාරං පට්ටියගේ සුරේද සුරවීර ‘සිංහලේ සුරේද‘ යන නමින් හදුන්වනු ලබන්නෙකු වන අතර ඔහුද ‘මහසෝන් බලකාය‘ ආරම්භක සාමාජිකයෙකු බවත් ඔහු විසින්ම තබන ලද සටහන් වලින් අනාවරණය වී තිබේ. මේ දක්වා දිගන පූජාපිටිය ආශ්‍රිතව සිද්ධිවලට සම්බන්ධ සැකකරුවන් 81 දෙනෙකු අත්අඩංගුවට ගෙන ඇති බවද පොලිසිය සදහන් කරන ලදි. මේ දක්වා මහනුවර සිදුවීම් 45 ක් වාර්තාවී තිබෙන බව දැන්වූ මාධ්‍ය ප්‍රකාශක සිදුවීම් වලින් දෙදෙනෙකු මියගොස් ඇති බවත් මුස්ලිම් කඩ සාප්පු 200 කට වැඩි ගණනක් විනාශ වී ඇති බවත් දන්වා සිටියේය. මෙවැනි වැරදි සඳහා අත්අඩංගුවට පත් වූ පුද්ගලයින්ට ඇප ලබාගැනීමට වුවද ඉතා සුවිශේෂී වූ කරුණු ඉදිරිපත් කළ යුතු බවත් 2018 අංක 01 දරණ හදිසි අවස්ථා (විවිධ විධිවිධාන සහ බලතල) රෙගුලාසි යටතේ කටයුතු සිදු කරමින් පවතින බව ද මාධ්‍ය ප්‍ර‍කාශකවරයා වැඩිදුරටත් පැවසීය. "ගැටුම් ගිනිදැල් මැදින් නැගී සිටි සැබෑ මිනිසුන්"
පසුගිය දින කිහිපය තුළ මහනුවර සිදු වූ ප්‍රචණ්ඩ ක්‍රියා සම්බන්ධයෙන් සැකකරුවන් නව දෙනෙකු අත්අඩංගුවට ගෙන ඇති බව පොලිසිය පවසයි. පොලිස් මාධ්‍ය ප්‍රකාශක නීතිඥ රුවන් ගුණසේකර අද බ්‍රහස්පතින්දා (මාර්තු 08) පැවති මාධ්‍ය හමුවක් අමතමින් කියා සිටියේ ඉහත කී සැකකරුවන් අතර 'මහසෝන් බලකාය' ලෙස හඳුන්වනු ලබන සංවිධානයේ ක්‍රියාකාරී සාමාජිකයෙකු වන අමිත් ජීවන් වීරසිංහ නම් තැනැත්තකුද සිටින බවය. දින කිහිපයක් පුරා මහනුවර ආශ්‍රිතව සිදුවන වර්ගවාදී ප්‍රහාර හේතුවෙන් ජිවිත හානි මෙන්ම දේපළ හානි රැසක් වාර්තා වී ඇත . නිවාස, ව්‍යාපාරික ස්ථාන, රථ වාහන හා ආගමික ස්ථාන රැසකට ප්‍රහාර එල්ල කෙරුණ අතර එමගින් සිදු වූ අලාභය තවමත් ගණන් බලා නොමැති අතර ඒ සඳහා කඩිනමින් වන්දි ලබාදීමට කටයුතු කරන බව රජය පවසයි. සිදු කළ අලාබ හානි පියවා ගැනීමට ප්‍රහාර එල්ල කළ පුද්ගලයන් ඇතුළු සෙසු ජනයාගේ බදු මුදල් යොදවමින් පෙරටත් වඩා හොඳින් එම ගොඩනැගිලි ඉදි කර දීමට රජය කටයුතු කරන බව නියෝජ්‍ය අමාත්‍ය රන්ජන් රාමනායක ඔහුගේ සමාජ ජාල අඩවියේ පළකර ඇත. දේපල විනාශ කිරීම තමන් විසින් තමන්ම විනාශ කර, රට තවදුරටත් ණය උගුල්වල සිර කරන ක්‍රියාවක් බවත් නියෝජ්‍ය අමාත්‍ය රන්ජන් රාමනායක පෙන්වා දෙයි. "හිතවත! හිතවතිය! ඔබේ 'ගෙලිඔය' නගරය ආරක්ෂා කිරීම අප සියලු දෙනාගේ වගකීමයි. සිංහල, දෙමළ, මුස්ලිම් සහෝදරත්වය කැටි කර ගෙන අපි ඉදිරියට යා යුතුයි. අපේ නගරය වගේම එහි ජීවත් වන සියලු දෙනා ආරක්ෂා කිරීම අපගේ වගකීමයි", සිංහල මුස්ලිම් ජනතාව එක්ව ජිවත්වන ගෙළිඔය නගරයේ පිහිටි බෞද්ධ විහාරස්ථානයේ ප්‍රචාරක රථය මෙවැනි නිවේදන නිකුත් කරමින් වීදී සංචාරයේ යෙදුණි. "අපේ වටිනා නිවාස, ජිවිත ආරක්ෂා කර ගැනීම සහ ගැටුම් වලට නොයෑම අපේ යුතුකමයි. අපේ මනසට විෂබීජ දාලා. අපේ නගරය, රට විනාශ කරන වැඩපිළිවෙල අපි නැවැත්විය යුතුයි" යනුවෙන් නිවේදනය කළ එම ප්‍රචාරක රථය පැය කීපයක් ගෙලිඔය ප්‍රදේශයේ සංචාරය කරමින් සාමය ආරක්ෂා කිරීම පිළිබදව ජනතාව දැනුවත් කිරීමට කටයුතු කර තිබුණි. තවදුරටත් ගැටුම් ඇති නොකර නිවාසවල රැඳෙමින් සිංහල හා මුස්ලිම් සමගිය ආරක්ෂා කර ගැනීමට සහයෝගය ලබා දෙන ලෙස අකුරණ ප්‍රදේශයේ පිහිටා තිබෙන මුස්ලිම් පල්ලියේ ශබ්දවාහිනිය මගින් දිගින් දිගටම නිකුත් කළ නිවේදන එහි සිටි මාධ්‍යවේදීන්ට අසන්නට ලැබුණි. මුරුතලාව ප්‍රදේශයේ තම පල්ලිය ආරක්ෂා කිරීම සඳහා ප්‍රදේශයේ හිමිනමක් ඇතුළු සිංහල තරුණයන් පිරිසක් එහි රාත්‍රිය ගත කළ බව මුරුතලාව ප්‍රදේශයේ මුස්ලිම් ආගමික නායකයෙක් පවසයි. නිවාස විනාශ වීම නිසා ඇතැම් මුස්ලිම් ජාතිකයන්ට නවාතැන් පහසුකම් ලබා දීමට ද ඇතැම් අසල්වැසි සිංහල නිවැසියන් ඉදිරිපත් වී ඇති බව දිගන ප්‍රදේශයෙන් වාර්තා විය. මුල් සිද්ධියේදී ජීවිතය අහිමි වූ සිංහල සහ මුස්ලිම් තරුණයන්ගේ ඥාතීන් දිගින් දිගටම ඉල්ලා සිටින්නේ මෙම මරණ හේතුකොටගෙන තවත් ගැටුම් නිර්මාණය කර නොගන්නා ලෙසයි. මහනුවර පරිපාලන දිස්ත්‍රික්කය තුළ ගතවූ පැය 18ක කාලය තුළ කිසිදු කළහකාරී ක්‍රියාවක් වාර්තා වී නොමැති නිසා, අද (මාර්තු 08) උදෑසන 10 සිට ඇඳිරි නීතිය තාවකාලිකව ඉවත්කිරීමට තීරණය කර තිබේ. මෙම සාමකාමී තත්වය හේතුවෙන් මහනුවර ප්‍රදේශයේ සාමාන්‍ය පරිදි සංචාරයේ යෙදිය හැකි අතර, දැනට එහි සිටින සංචාරකයන්ගේ ආරක්ෂාව තහවුරු කිරීමට කටයුතු කරන බව ශ්‍රී ලංකා සංචාරක ප්‍රවර්ධන අධිකාරිය නිකුත් කළ වාර්තාවක සඳහන් වේ. මහනුවර දිස්ත්‍රික්කය තුළ ඇඳිරි නීතිය ක්‍රියාත්මක වන කාල සීමාවේදී එහි සිටින සංචාරකයන්ට අවශ්‍ය නම් ප්‍රදේශයෙන් පිටවී යෑම සදහා විශේෂ බලපත්‍රයක් නිකුත් කිරීමට සංචාරක ප්‍රවර්ධන අධිකාරිය කටයුතු කර තිබුණි. මහනුවර ගැටුම්කාරී තත්ත්වයක් නිර්මාණය කිරීමට සහ ජාතීන් අතර අසමගිය ඇතිවන ආකාරයට අසත්‍ය තොරතුරු ප්‍රචාරය කිරීම සම්බන්ධයෙන් 10 දෙනකු අත්අඩංගුවට ගත් බව පොලිස් මාධ්‍ය ප්‍රකාශක පොලිස් අධිකාරී රුවන් ගුණසේකර මහතා කියයි. ත්‍රස්ත විමර්ශන කොට්ඨාසයේ නියෝජ්‍ය පොලිස්පතිවරයාගේ ප්‍රධානත්වයෙන් මේ සම්බන්ධයෙන් විමර්ශන ආරම්භ කළ බවත් ඒ අනුව එම කොට්ඨාසයේ නිලධාරීන් කණ්ඩායමක් මහනුවරට පරීක්ෂණ ආරම්භ කළ බවත් එම විමර්ශනයේ ප්‍රතිඵලයක් ලෙස සැකකරුවන් දස දෙනා අත්අඩංගුවට ගත් බවත් ගුණසේකර මහතා පවසයි. මෙම ක්‍රියාවන්ට සම්බන්ධ ප්‍රධාන සැකකරු විදාන පතිරණගේ අජිත් ජීවන් වීරසිංහ බවත් අනිත් ප්‍රධාන සැකකරු සුරේද සුරවිර බවත් අත්අඩංගුවට ගත්තවුන් අතර මේ දෙදෙනාද සිටින බවත් පොලිස් මාධ්‍ය ප්‍රකාශකවරයා ප්‍රකාශ කරයි. මෙම සැකකරුවන් දිගන හා පූජාපිටිය ප්‍රදේශවලදී අත්අඩංගුවට ගෙන ඇති අතර ඔවුන්ගෙන් අට දෙනකුම මහනුවර දිස්ත්‍රික්කයෙන් පිට පදිංචිකරුවන් බව පොලිසිය කියයි. ඔවුන්ගෙන් ප්‍රශ්න කිරීමේදී මෙය සැලසුම් කළ ආකාරය ගැන අනාවරණය වෙමින් පවතින බවත්, එම තොරතුරු අනුව මීට සම්බන්ධ සෙසු සියලු සැකකරුවන් තරාතිරම නොබලා අත්අඩංගුවට ගන්නා බව පොලිසිය සඳහන් කරයි. අත්අඩංගුවට ගත් එක් ප්‍රධාන සැකකරුවකු ගිංතොට කළබලය අවස්ථාවේ එම ප්‍රදේශයේ විහාරස්ථානයකට ගොස් ප්‍රචණ්ඩකාරීව හැසිරෙන ආකාරය ප්‍රදේශයේ තරුණයන්ට කියා දී ඇතැයි ද, ඔහු ගැන එදිනම පොලිසියට දැනුම්දී ඇතැයි ද දැනගන්නට තිබේ. 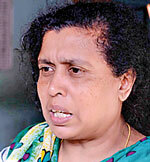 Mob attacks in Kandy are targeted and well planned, witnesses say, as fears grow over threats to Sri Lanka's stability. 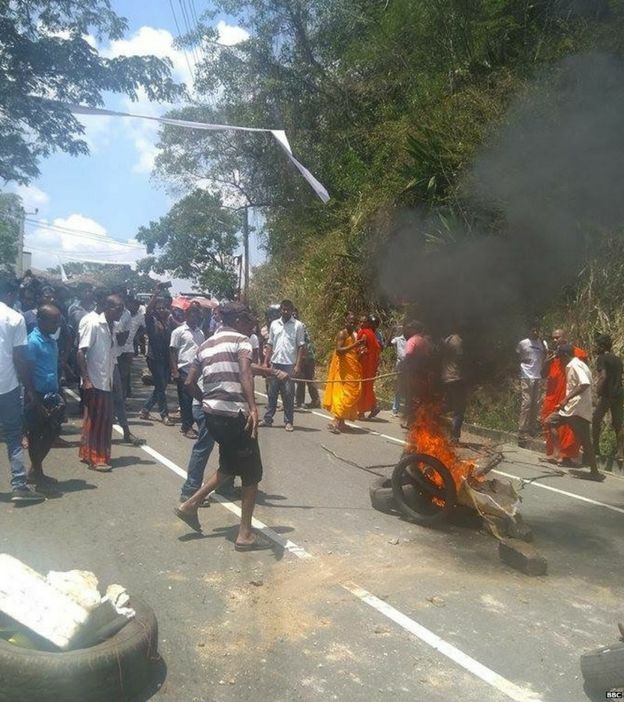 Ambatenna, Sri Lanka - The Sinhalese Buddhist mob came by the hundreds, screaming at the top of their lungs and carrying sticks, stones and petrol bombs, as they descended on the hill town of Ambatenna in central Sri Lanka on Wednesday. 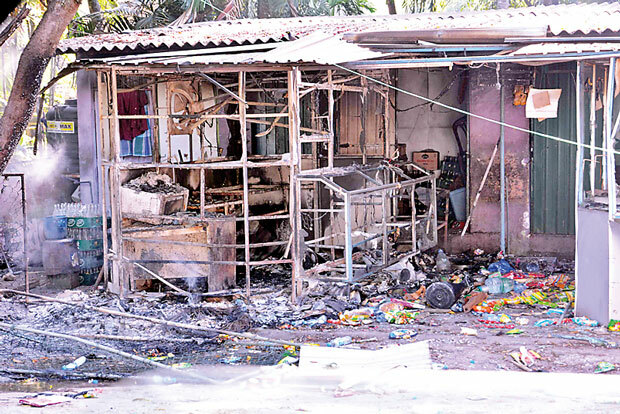 Some two dozen policemen and soldiers watched helplessly, according to residents, as the mob vandalised and set fire to Muslim homes and businesses in the town's Welekada area. "We were so scared," Fathima Zameer told Al Jazeera, clutching her three-week-old infant as she recounted the violence that swept through her neighbourhood that morning. "We have nowhere to go. They broke all the windows in my house. Our whole house is burnt." 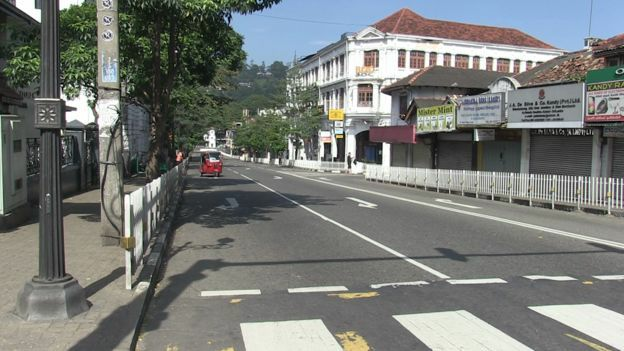 The mob, which witnesses said was between 200 and 500-strong, overran Welekada defying a curfew and a state of emergency imposed by President Maithiripala Sirisena a day earlier to quell anti-Muslim riots that began in the highland district of Kandy over the weekend. 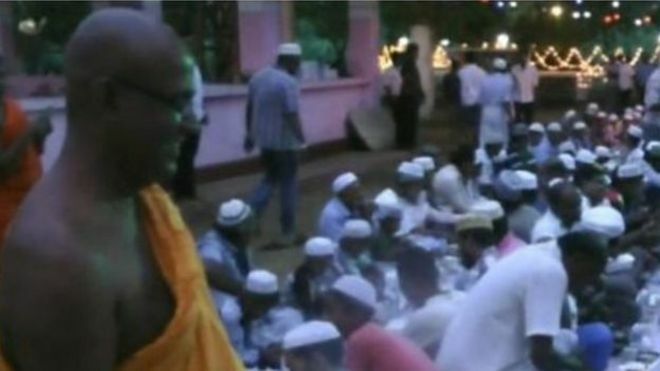 In Welekada, rioters vandalised at least 15 houses belonging to Sri Lanka's Muslim minority and a mosque, residents told Al Jazeera. Four of the buildings and several vehicles were also torched. 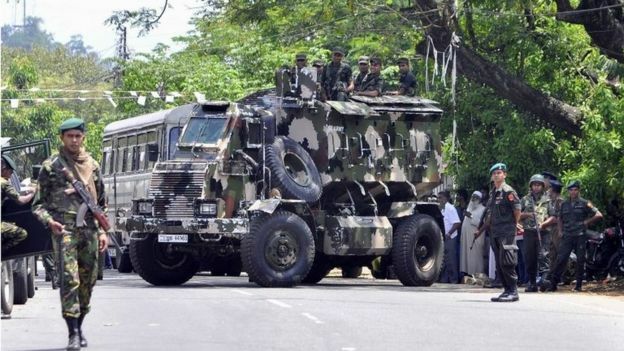 The attacks have raised fears of a return to conflict and instability in Sri Lanka, less than a decade after the South Asian island nation ended a bloody civil war with Tamil separatists. The latest bout of communal violence began on Sunday when a man from the mainly Buddhist Sinhalese majority died after being beaten by a group of Muslim men over a traffic accident in the town of Teledeniya in Kandy, an area famous for its tea plantations and Buddhist religious sites. 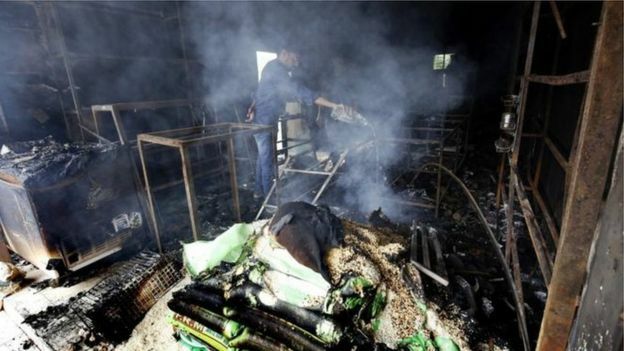 The next day, hundreds of Sinhala Buddhists, mostly outsiders, according to officials and residents, poured into Kandy and attacked and torched dozens of Muslim businesses, houses and mosques. The body of a 23-year-old Muslim man was found in a burned building, and the government, fearing more violence, imposed a state of emergency on Tuesday. It also deployed the army and extended a police curfew in the region. The violence, however, continued. 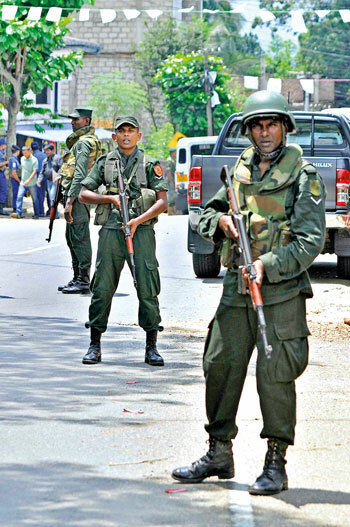 Overnight on Wednesday "several incidents" were reported in four towns, said Ruwan Gunasekara, a police spokesman. Three police officers were injured during clashes in Menikhinna, he said. 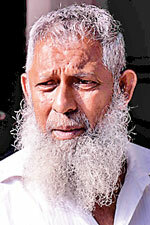 Later in the day, Ambatenna was attacked and a Sinhalese man was killed there after a hand grenade he was carrying exploded. 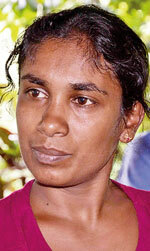 Gunasekara said security forces have arrested about 35 people since the riots began. The government has also suspended internet services in the area and blocked access to Facebook and other social messaging applications including Whatsapp and Viber in an attempt to halt incendiary rumours. Shukry Cassim, whose four-bedroom house was vandalised in Welekada, said he was "petrified". "We don't feel safe. All our children are traumatised. We don't know where to go, or who to trust," the 27-year-old accountant told Al Jazeera, standing in front of the burned hulk of his car in his garage. "We don't know why this is happening. The mob is not from our area. We don't know them," he said. "But they couldn't have done this without the support of people from our area because they have targeted the Muslim houses, and excluded the non-Muslim houses." Cassim, however, said the violence was instigated by "a few people". 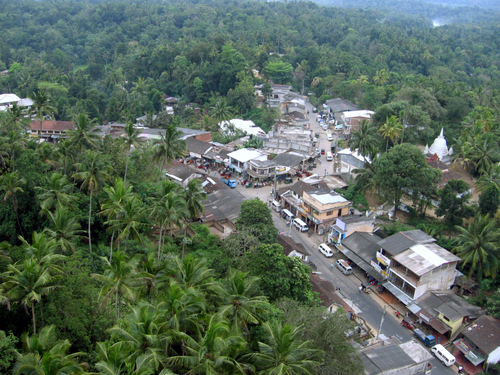 Relations between Muslims and Buddhists in the Kandy district have been historically harmonious, he said, adding: "We share food during religious festivals, we play together and buy goods from each other's shops." Analysts say tensions flared up between the two communities because of the rise of Buddhist nationalist groups following the end of the country's three-decade war. 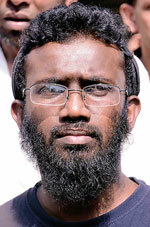 These groups include the monk-led Bodu Bala Sena, which has links to Buddhist hardline groups in Myanmar. They are widely perceived to have the support of former President Mahinda Rajapakse, and accuse the Muslims, who make up 10 percent of Sri Lanka's 21 million population, of forcing people to convert to Islam and of destroying sacred Buddhist sites. Prior to the Kandy riots, at least three other major incidents of anti-Muslim violence have been reported in the past year. "Sri Lanka is on the brink," said Alan Keenan, a researcher at the International Crisis Group. "These attacks are organised, well-planned," he said. "And there is good reason to believe they are partly designed to provoke a Muslim response, which would then justify more violence against Muslims." The Muslim community has "been admirably restrained" so far, he said. But if the minority retaliates by attacking the Sinhalese community, "other Sinhalese will then feel threatened and participate in a way they haven't yet". Keenan also said he was concerned by the inability of the army and the police to control the riots. "The reason for this is unclear - whether they [the security forces] have been badly deployed, or deployed in inadequate numbers. What worries me is the hypothesis that some significant degree of the police and military are sympathetic to the rioters, which would not be surprising," he said, referring to reports of state collusion in the clashes that broke out between Muslims and Buddhists in 2014 which left four dead and many injured. 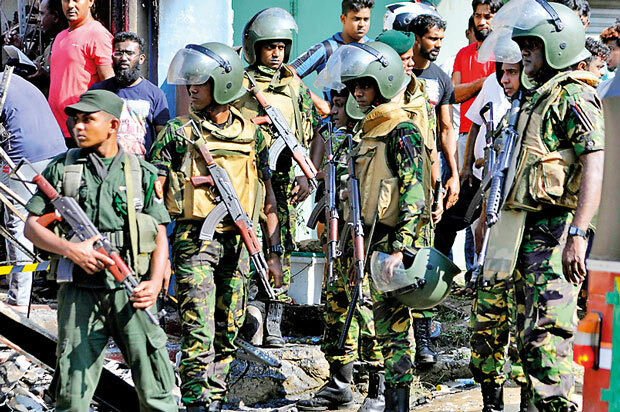 A third factor may be that security forces are "cautious" to act, Keenan said, because of Sirisena's coalition government's humiliating defeat to Rajapakse's party in local council elections in February. Sirisena ousted Rajapakse, who is accused of authoritarianism, corruption and human rights abuses, in 2015 after campaigning on a platform of national reconciliation and constitutional reform. However, the coalition that brought the president to power was in tatters ahead of the February vote. Rajapakse's party win "emboldened" Sinhala Buddhist hardline groups and "more crucially, police and other state officials are now more likely to hedge their bets," said Keenan. "They [the police] may not be sure if they should go after the rioters. 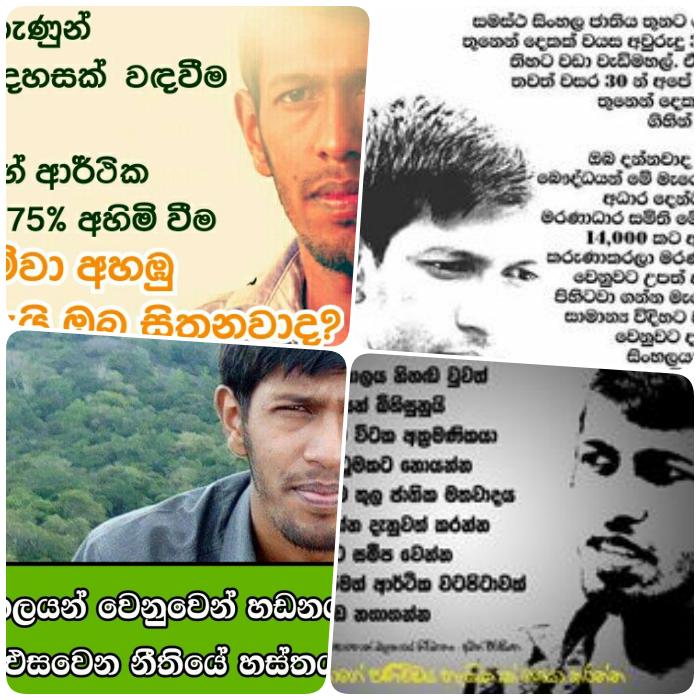 Because they are known to have the sympathy, if not the active support of Rajapakse and his people. "If Rajapakse and his people are going to be running the government soon, which is possible, a police officer wouldn't want to be known as the courageous guy who did his duty and stopped the violence." If the clashes continued, said Paikiasothy Saravanamuttu, executive director at the Centre for Policy Alternatives, a Colombo-based think-tank, the future of Sirisena's government could be in jeopardy. "Some say [the riots are instigated] to show that this government is incompetent and incapable," he said. "Others say this is to create instability, which will expedite yet another regime change." Urging Sirisena and Prime Minister Ranil Wickeremasinghe to "act fast, quickly and decisively," Saravanamuttu said security forces must arrest perpetrators of the violence and "it should be communicated to the country at large that we are a multi-ethnic, multi-religious country and we intend to stay so". 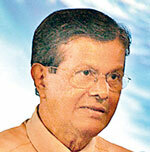 The conflict could also affect Sri Lanka's economic recovery after decades of war, he warned. "If we continue with emergencies and blocking social media, tourists are not going to come and investors are going to start thinking twice," he said. Back in Welekade, Zameer said she was "hurt" and "heartbroken" by the violence. "We want safety and security. We don't want anyone to face this," she said. Cassim echoed her sentiments: "I have tasted the bitterness of war. And I want peace." Irfan Cader reported from Ambatenna. Zaheena Rasheed reported and wrote from Doha. අම්පාර – තෙල්දෙණිය ප්‍රදේශවල සිදු වූ ලේ වැකි සිද්ධිදාමයේ මහ මොළකරු කොළඹ දිස්ත්‍රික්කයෙන් පාර්ලිමේන්තුවට පැමිණි, ජාතික ඇඳුම් අදින, උස හීන්දෑරි හාදයකු බව ජාතික නිදහස් පෙරමුණේ නායක විමල් වීරවංශ මහතා හෙළිකර සිටියේය. අද (06) පාර්ලිමේන්තුවේ පැවති කල්තැබීමේ විවාදයට එක්වෙමින් ඒ මහතා මෙසේ හෙළිකර සිටියේය. එහිදී වැඩිදුරටත් අදහස් දැක්වූ විමල් වීරවංශ මහතා මෙසේ ද සඳහන් කළේය. “තෙල්දෙණියේ ලේ වැකි සිද්ධිදාමය හේතුවෙන් කුමාරසිංහ නමැති සිංහල දෙදරු පියකු ද අබිදුල් බාස්ත් නැමැති මුස්ලිම් තරුණයකු ද මියගියා. 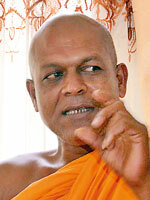 මේ දෙදෙනාම ලක්මාතාවගේ දරුවෝ. මම පළමුවෙන්ම මේ අයගෙ පවුල් වෙත ඒකාබද්ධ විපක්ෂය ලෙස අපගේ සාතිශය සංවේගය පළ කර සිටිනවා. මැතිවරණයෙන් පසුව ආණ්ඩුව අර්බුදයට ගිහින් තිබෙන වෙලාවේ, අග්‍රාමාත්‍යවරයාට එරෙහිව අභ්‍යන්තර කැරැල්ලක් නිර්මාණය වී ඇති වෙලාවේ, ඒ සියලූ මාතෘකා යටපත් කරලා රටට අහිතකර මාතෘකාවක් අද නිර්මාණය කරලා තිබෙනවා. ආණ්ඩුව මේ අහිතකර තත්වය පාලනය කිරීම හිතාමතාම පැහැර හැර ඇති බවයි අපට පෙනෙන්නේ. ඒකාබද්ධ විපක්ෂයේ මහනුවර දිස්ත්‍රික් පාර්ලිමේන්තු මන්ත්‍රී දිලුම් අමුණුගම මන්ත්‍රීවරයා මධ්‍යම පළාත භාර නියෝජ්‍ය පොලිස්පතිවරයාගෙන් ඉල්ලා සිටියා, ‘ගැටුම්කාරී සිදුවීමක් ඇතිවිය හැකියි. එය පාලනය කිරීමට මැදිහත් වෙන්න’ කියා. නමුත් නියෝජ්‍ය පොලිස්පතිවරයා එය පිළිගත්තේ නැහැ. ඔහු කියා තිබෙනවා ‘අපි එම තත්ත්වය පාලනය කර තිබෙනවා. 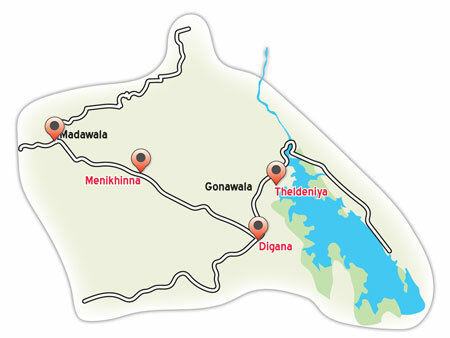 ඒ ගැන අපි බලාගන්නම්’ කියලා. නමුත් තෙල්දෙණිය ප්‍රදේශයේ මවුලවීතුමකු සිදුව ඇති තත්වය පිළිබඳ මාධ්‍යයට ලබා දුන් ප්‍රකාශයක් අප සතුව තිබෙනවා. මෙම ප්‍රකාශයට අදාළ වීඩියෝපට මේ වන විට මුහුණුපොතේ ද තිබෙනවා. එතුමා ප්‍රකාශ කරනවා ‘පොලිසියෙන් අපට කීවා, ගෙවල් ඇතුළට වෙලා ඉන්න. අපි ආරක්ෂාව සලසනවා කියලා. අපි ගෙවල් ඇතුළට වෙලා ඉදිද්දි ලයිට් කැපුවා. ඒ ලයිට් කපපු වෙලාවේ තමයි සංවිධානාත්මක පිරිස් ඇවිත් ගිනි තියාගෙන ගියේ’ යනුවෙන්. ඒ අනුව ඉතා පැහැදිලිව පෙනෙනවා, මේක පූර්ව සැලැසුමකට අනුව සිදු කළ දෙයක් කියලා. මේ දිනවල ස්වාධීන රූපවාහිනියේ පෙන්වන ‘කූඹියො’් ටෙලි නාට්‍යයේ ඉන්නවා ‘ජෙහාන්’ කියලා ගේම්කාරයෙක්. ඒ වගේ මේ ලේ වැකි සිද්ධිදාමය පිටුපස්සේ ද ජෙහාන් කෙනෙක්, ගේම්කාරයෙක්, මහ මොළකරුවෙක් ඉන්නවා. එයා කොළඹ දිස්ත්‍රික්කයෙන් පාර්ලිමේන්තුවට ආපු, ජාතික ඇඳුම අඳින, උස හීන්දෑරි හාදයෙක්. ඔහු තමයි මේ ලේ වැකි සංවිධානාත්මක අපරාධය පිටුපස්සේ ඉන්නේ. අම්පාර හෝටලයකට ගිහින් මේ සිද්ධිදාමයට අදාළ පළමු ගිනිකුර පත්තු කළේ කවුද, කියා මේ ආණ්ඩුව කිසිම සොයා බැලීම්ක් කළා ද? මා ජවිපෙ නායක අනුර දිසානායකගේ කතාව අසාගෙන සිටියා. ඔහු අපේ ආණ්ඩුව කාලයේ අලූත්ගම සිදුවූ අවාසනාවන්ත සිදුවීම් ගැන කීවේ කුමක්ද? ‘ඒක රාජපක්ෂවරුන්ගේ බලය තහවුරු කර ගැනීමට සිදු කළ දෙයක්’ කියලයි. මෙදා කීවේ, ‘බලයේ ඉන්න අය බලය තහවුරු කර ගැනීමටත් බලයට එන්න ඉන්න අය බලය ලබා ගන්නත් මේ දේවල් කරනවා’ කියලයි. එදා බලයට එන්න බලා ගෙන හිටපු රනිල් වික්‍රමසිංහලාට එයා ඇඟිල්ල එසවූයේ නැහැ. ඇයි තමුන්නාන්සේලා බලයට ආවට පස්සේ අලූත්ගම සිදුවීම පිළිබඳව සොයා බලන්න කොමිසමක් පත් නොකළේ? එහෙම ක්‍රියාමාර්ගයක් ගත්තා නම් අද මෙවැනි ලේ වැකි සිද්ධිදාමයක් නිර්මාණය කිරීමට ඉඩ ලැබෙන්නේ නැහැ.